Home What is behind the All Blacks’ Haka? What is behind the All Blacks’ Haka? New Zealand players perform the Haka before taking on Australia in 2018. It’s what representing their country is all about -- walking out in New Zealand’s All Blacks jersey, facing their opposition, and delivering a spine-tingling, hair-raising Haka before the whistle blows for kick-off. The sights and sounds of the Haka -- feet stomping, fists pumping, vocal chords straining -- are deeply entrenched within New Zealand culture. “For me, the Haka is a symbol of who we are and where we come from,” former All Blacks captain Richie McCaw told CNN in 2015. Hakas have recently been performed across the country in the wake of the Christchurch mosque shootings as a way of unifying people at times of grief. There are many different types of Haka, and the All Blacks, arguably the world’s most prolific sports team, perform their own before each game. A ceremonial Maori war dance performed before each game, the Haka is intended as a challenge to opponents and a rallying cry before heading into battle. “It has a much wider interest value and a much wider intrinsic drilling into the nation of ours,” explains Luke Crawford, New Zealand Rugby’s Maori culture advisor. 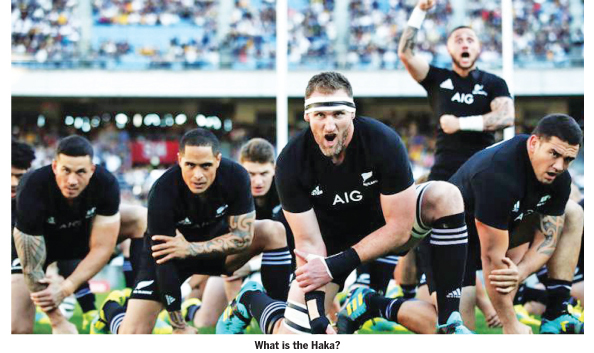 “When people are asked to stand and identify themselves, often Haka is a place that people are comfortable to go to ... they will actually utilize that medium as an identifier and a connector back to the land. Crawford travels around the world with the Maori All Blacks -- a representative New Zealand team in which every player has Maori genealogy. He says he’s trying to encourage the introduction of video analysis to review how players are performing the Haka. In his eyes, a good Haka can lead to a better performance on the pitch. “There are definite correlations,” says Crawford, “but also there are some definite benefits within our culture that can add and enhance what is a high-performance environment. A well-executed Haka, coupled with a powerful riposte from the opposition, can be more memorable than a game of rugby itself. If the Haka is, after all, a challenge, then meeting and accepting that challenge is part of the battle. In 2008, a face-off between Wales and New Zealand lasted 90 seconds after All Blacks players had finished the Haka. It took much persuasion and whistle blowing from referee Jonathan Kaplan to separate the two teams and get the game under way. At the 2007 and 2011 World Cups, French players linked arms and edged towards the New Zealand team while the Haka was being performed. The two sides ended inches away from each other. Meanwhile, in 1996 an Australian team chose to ignore the Haka altogether, instead carrying out warm drills deep in their own half. Schools in New Zealand perform their own version of the Haka. Learning the routine is an important part of the curriculum, along with their lessons in Maori language. Neitana Lobb is head of Te Reo Maori at Auckland Grammar School and is responsible for overseeing the school’s performance of the Haka. Auckland Grammar has been performing the same routine for nearly 20 years, and encouraging boys to practice is not a problem Lobb encounters very often.